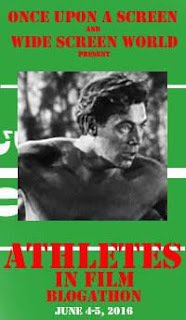 This is my entry to Once Upon a Screen and Wide Screen World's Atheletes in Film Blogathon. 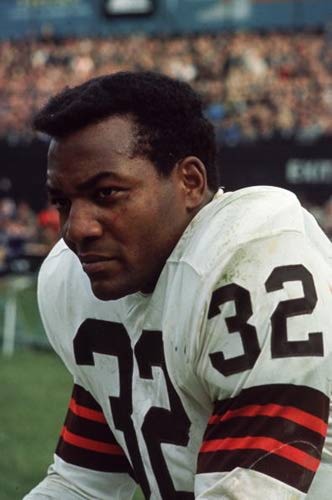 Jim Brown, was an all-star fullback, who played out his entire football career with the Cleveland Browns. He set and held many records, one of which he still holds, that of 6 games with 4 rushing touchdowns per game. (Two former players are tied for second with 5 games with 4 such touchdowns). He was the first player to ever have 100 + rushing touchdowns. 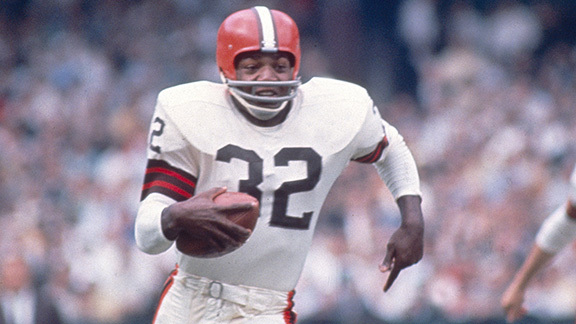 Brown was drafted 6th overall in the 1957 NFL draft by the Cleveland Browns. In 9 years he was elected to the Pro Bowl 8 times. Along with Johnny Unitas and Brett Favre, he is one of only four NFL players to have received an NFL MVP award. (Peyton Manning, the fourth in that list has 5) . He had a stellar career has a player. It was while on the set filming today's movie selection, The Dirty Dozen, that Brown decided to retire. The story behind that retirement is interesting in itself. It's a sure bet Jim Brown could have had several more years in the football world. He had previously said he wanted to retire after his contract ended that year. But it was delays in the filming of Dozen that threatened to cause him to be late for training camp for the 1967 season. Art Modell, the owner of the Browns, threatened to fine him for each week he was late. Brown, doing exactly what I would have done, only in less amicable terms, retired from the NFL, and devoted himself to his acting career. The Dirty Dozen is an action-adventure/war movie that takes place during the later years of WWII. 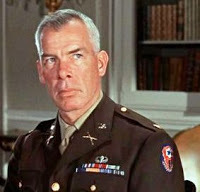 Major John Reisman (Lee Marvin), a maverick officer, is tasked with the job of taking 12 criminals with varying criminal convictions, and training them and conforming them into a crack squad of soldiers for a secret assignment. The assignment is to invade a Nazi chateau where officers from the German army have a retreat, and kill as many of the officers as possible. In an effort to do this, Reisman, and his right hand man, Sgt. Bowren (Richard Jaeckel) take the 12 prisoners to a remote area where they train aggressively and build their own encampment from scratch. The 12 consist of what the commentaries refer to as "the front six" and "the back six". This is a concession to the actors who played them, not their importance to the mission, however. The "front six" actors came in with some significant background while the "back six" are guys you likely haven't heard of or seen since. "The front six" consisted of John Cassavettes (Franko), Clint Walker (Posey), Charles Bronson (Wladislaw), Telly Savalas (Maggot), Donald Sutherland (Pinkley) and Jim Brown (Jefferson). "The back six" included Al Mancini (Bravos), Stuart Cooper (Lever), Tom Busby (Vladek), Ben Carruthers (Gilpin), Colin Maitland (Sawyer) and Trini Lopez (Jimenez). Note: Trini was a folk singer, and so had a bit more public exposure than the rest of the back six. Jim Brown's character, Jefferson, is one of only 5 of the prisoners who are escaping the hangman by participating in this endeavor. (The rest just have long terms of imprisonment). In Jefferson's case, apparently he killed a couple of racists who were going to try to castrate him. In this respect, Jefferson is a WWII stand-in for the racism that was prevalent in the southern United States at the time. Since this is an ensemble cast movie, there is plenty of camera time for everyone. The first scenes of the movie involve Reisman's briefing in London of his mission. It is here we see how rebellious and cantankerous his character can be. 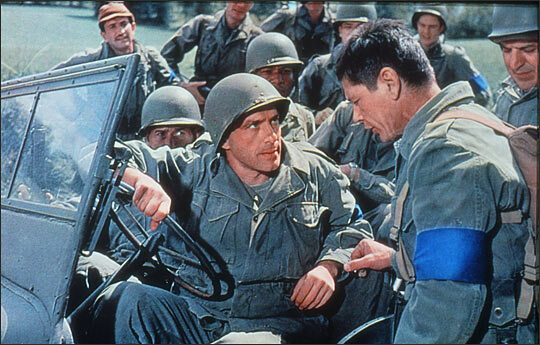 Joining him in this scene are Ernest Borgnine and Robert Webber as his superior officers, Generals both, and his friend and fellow Major played by George Kennedy. By far, the most interesting characters of the movie are Franko and Maggot. Franko plays the hotheaded, rebellious, officer-hating bit to the hilt, and Maggot, a religious zealot who takes his divine blessings by his God a bit too far are both unstable dynamite sticks in the midst of the compound. It is interesting to watch how each reaches his own destiny within the film. The film transitions, after the initial meeting of the twelve prisoners, to the boot camp that will be their training grounds. Each of the major characters gets to show his chops in scenes devoted to this training. Franko, at one point tries to take it on the lam, but is stopped by Jefferson and Wladislaw. There is quite a bit of testing in the campgrounds to see what each can get away with, and a revolt, led by Franko, which ends up denying them the use of soap and shaving equipment and eventually gives them the moniker of the "Dirty Dozen". 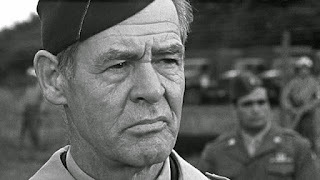 Things heat up slightly when the crew has to go to the army base of Colonel Breed (Robert Ryan), a by the book officer who despises Reisman (the feeling is mutual), and tries to find out he details of the secret mission. He comes away empty-handed, though, because Jefferson and Posey (the other big boy in the troop) take out his two top dog inquisitors in a fight in the barracks washroom. A short time later Breed shows up at the secret camp with armed troops to get the lowdown on the mission and is once again humiliated by Reisman and crew. But Reisman gets called up to HQ and is unceremoniously taken off the mission. Reisman counters with a challenge that, during an upcoming war games, his crack troop could take out Col. Breed and his headquarters. The crew succeed, so the mission is reinstated. The final moments of the mission are played out with relentless suspense. Included in the final moments is a chance for our subject, Brown, to show off that speed that made him such a star on the football field, as he races from one end of the grounds to the other, dropping grenades as he goes. This is war, however, and not all of the dozen survive until the end. 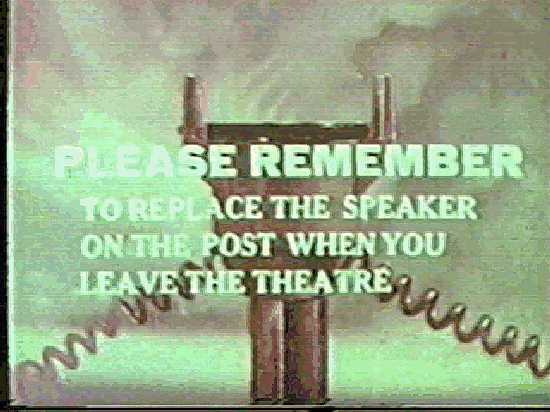 But you'll have to watch to see just which ones do. 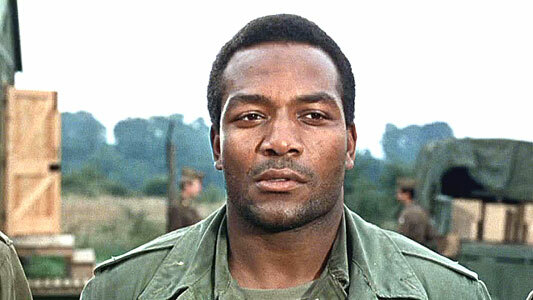 Jim Brown went on from here and to date has been in some 40+ movies, including a run from the late sixties to the late seventies in which he played the lead role. He still continues to act, most recently playing himself in Draft Day (2014). Well, the stadium lights just dimmed, as so the game draws to it's end. Have a safe drive home, kiddies. Fantastic! 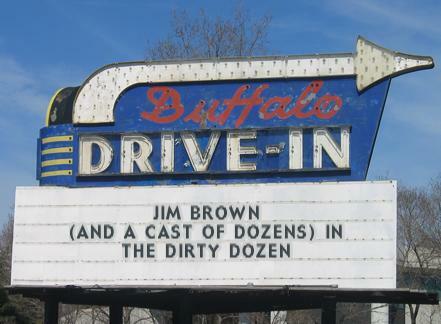 Love this entry and the spotlight on Jim Brown and his career. 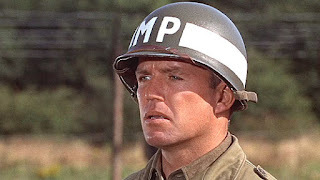 I love THE DIRTY DOZEN and you've made me want to watch it again. That's the bad part about these blogathons things. Too much fabulousness. 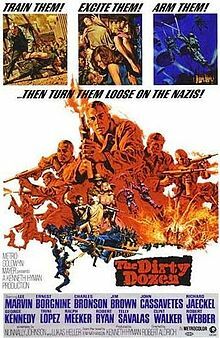 I have seen "The Dirty Dozen" in bits and pieces throughout the years, but never all the way through from beginning to end. It is one of those movies that if you come across it there is no hope of turning away. If that's the case, why have you only seen "bits and pieces"...? LOL It is worth 2 ½ hours of your time. Trust me. Thanks for the comments. It's been way too long since I've seen The Dirty Dozen. Every time I watch it I think, This is not my kind of movie, but I absolutely love it. As for Jim Brown, I knew he was a football player, but I had no idea how distinguished a career he'd had. II have no idea what a rushing touchdown is, but his doing 100+ of them is certainly impressive. Great film, you have made me want to see it again soon. 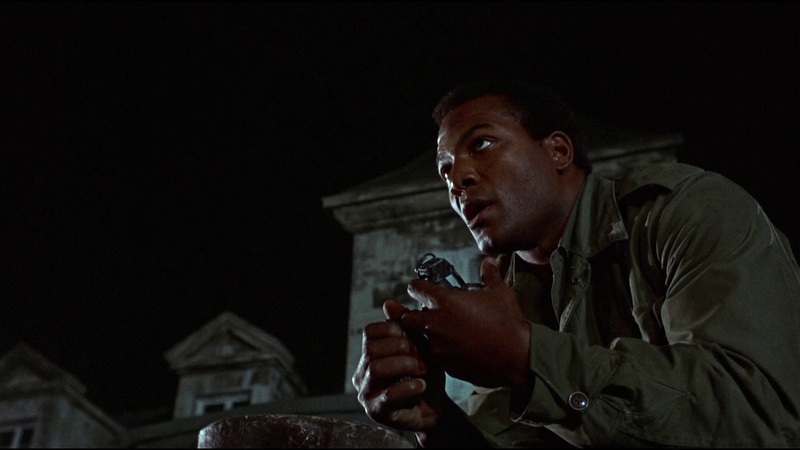 Jim Brown was indeed as good an actor as he was an athlete, one of the few to have equally impressive careers in both fields. Big Cassavetes fan here too, I only wish he had acted in a few more films other than the ones he directed. 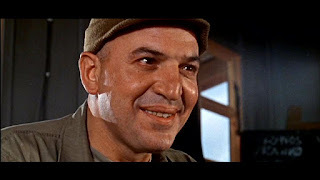 And great to see lee Marvin and Charles Bronson again--they also appeared together in very small roles as seamen in The Caine Mutiny, which I recently watched again. Dirty Dozen is a real classic, thanks for highlighting it!